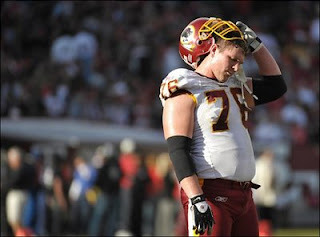 When I played organized football, I played offensive line almost exclusively. In junior high and my first year on varsity I played center. My junior year I was moved over to right tackle. Being tall and stuck right in the middle of the line didn't exactly bode well for our short QB...the back of my helmet has its fair share of football scuff marks. I moved to right tackle in '96. Just so happens that I was #77 and I was a huge Michigan fan. 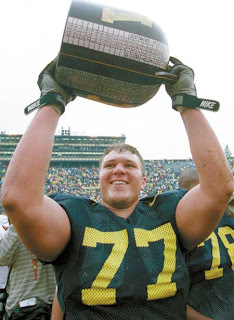 And just so happens that Jon Jansen was also #77, starting right tackle, and a junior at Michigan. The stars aligned and I had an automatic role model. The definition of consistency, he set the secord for most starts in Michigan history with 50. He never missed and game. His teamates nicknamed him "Rock". 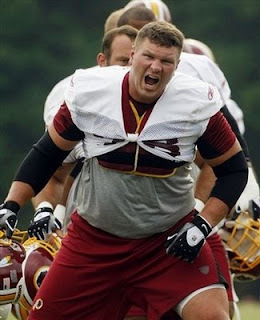 Jansen was drafted in 1998 to the Washington Redskins (37th overall pick) where he has started 123 games at right tackle over the past 10 years. He tore his achilies in 2004, and has battled with nagging injuries since then. Last year he lost his starting role, but regained it by mid-season. Just about a week or so ago, Redskins owner Daniel Snyder and head coach Jim Zorn met with Jansen to discuss their move to cut him from the team. They said they wanted to move the team in a new direction, and a 10 year veteran pro-bowler is not what they are interested in. They graciously offered to allow Jansen to retire as a Redskin, but Jansen declined. Zorn was quoted to the Washington Times that Jansen was still a very solid run-blocker, but struggled in pass-protection. So now the Clawson, MI native is going to return home. 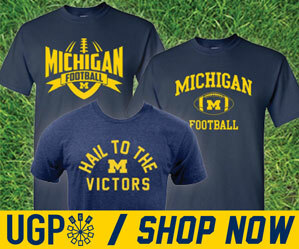 And pending a physical, will sign a 1-year deal to play for the Detroit Lions. Sounds good to me. Any signs of life on the offensive line for the Lions will go a long way in hopefully regaining some sense of respectability this season. And maybe having a decorated NFL veteran in attendance on the Michigan sidelines this season will benefit recruiting as well. Welcome home Jon. Good Luck in Detroit.